Gal Gadot unveiled the final trailer for Patty Jenkins' Wonder Woman movie at the MTV Movie and TV Awards tonight. Gadot and her costar, Chris Pine, have been listed as presenters since the announcement of the awards ceremony and it was assumed that a clip would be made for the event. But Gadot took to her Twitter account yesterday to announce that in addition to presenting that she also a "wonder-ful" surprise in store for everybody. This is the first year that MTV has added the television aspect to the show and this will also be the first year of the show being called the MTV Movie and Television Awards. The awards show is being held at the Shrine Auditorium in Los Angeles and will be hosted by comedian, Adam Devine (Workaholics). In addition to the exclusive Wonder Woman trailer, the show will also have an exclusive sneak peek into the new adaptation of Stephen King's IT and another exclusive sneak from the upcoming Transformers 5 movie and Spider-Man: Homecoming. MTV has also started something new for this year by having male, female, and gender non-conforming nominees pitted against each other instead of having a best actor or best actress award. Gal Gadot debuted the footage on Twitter after it aired on the MTV Movie Awards. 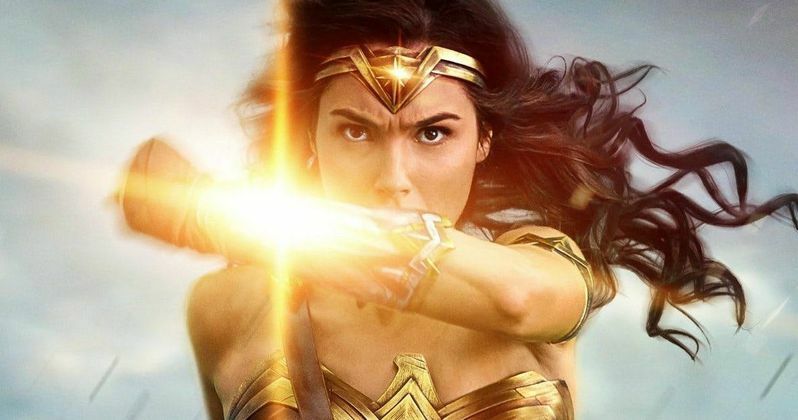 Wonder Woman has seen some controversy over the last few weeks including the previously reported "armpit gate" and a lack of promotion from Warner Bros. The internet was on fire last week over a video still that showed an apparent unnatural, silky smooth, and discolored armpit of Wonder Woman. The Warner Bros. team has since gone in and retouched Wonder Woman's armpit to look tan, like the rest of her body and everybody seems to sleep better at night because of it. The exclusive fourth trailer for the MTV awards seems to be in response to the lack of promotion Wonder Woman has gotten. The movie is set to open in less than a month and has received a fraction of the promotional material of say Suicide Squad and Batman Vs. Superman. From Warner Bros. Pictures and DC Entertainment comes the epic action adventure starring Gal Gadot, Chris Pine, Connie Nielsen and Robin Wright, directed by Patty Jenkins. Before she was Wonder Woman, she was Diana, princess of the Amazons, trained to be an unconquerable warrior. Raised on a sheltered island paradise, when an American pilot crashes on their shores and tells of a massive conflict raging in the outside world, Diana leaves her home, convinced she can stop the threat. Fighting alongside man in a war to end all wars, Diana will discover her full powers...and her true destiny. Warner Bros. has given Patty Jenkins's Wonder Woman a June 2 release date, where it will go up against Captain Underpants. Early box office projections have put Wonder Woman at an $80 million opening weekend, but we'll have to wait and see. Take a look at the new footage from Wonder Woman below.